Are you experiencing slow logons for your Citrix XenApp/XenDesktop environments? Is it slow even though it’s running on the latest greatest hardware and the environment is brand new? The culprit is likely a misconfigured Profile Management solution. Citrix Profile Management, the free solution that comes with XenApp and XenDesktop is easy to configure but also easy to mess up. 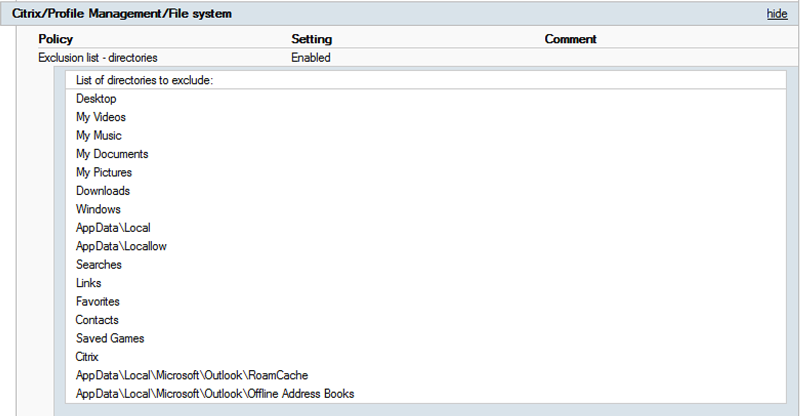 This utility is configured via GPO either using .adm or admx files. When Profile Management is done correctly the profile should never exceed 10-20MBs of space. Here’s what should be in the profile to be processed on logon, anything more is going to slow you down. ntuser.dat: The user’s registry hive. This isn’t very large regardless of what is happening. AppData\Roaming: Typically unavoidable, preserving the entirety of the folder usually isn’t more than a few MBs of space, but it is a place to observe just in case it starts to grow. AppData\Local: In this location extremely large portions of data can reside so effort needs to be made to only include critical data here. These three things are it. If any more is being retained, then it’s misconfigured and logon times are probably longer then they need to be. What about My Documents, Pictures, Music, Downloads and all of the user shell folders? These should never reside within the profile, as we can use various methods/policies to redirect them to a file server. So now let’s take a closer look at what should be excluded, redirected and ignored in a proper Citrix Profile Management configuration. 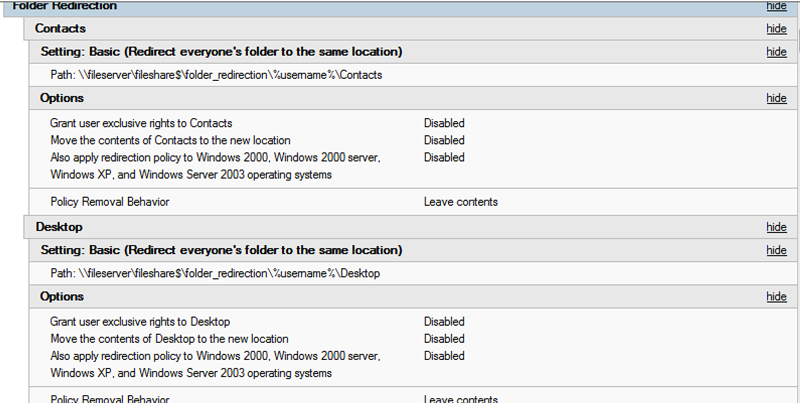 Use these same settings in the example for Contacts above and use for all of the other User Shell Folders. Since this is a user based GPO, it’s essential that Loopback Processing be enabled in merge or replace mode on the GPO on the OU where the XenApp/XenDesktop computer account resides in Active Directory. We don’t want to link the GPO to where the user object is in Active Directory, as we only want these settings to apply when the user is logged onto the XenApp/XenDesktop environment. Another note: Some suggest that you redirect AppData\Roaming. I do not recommend this, as AppData\Roaming is being read and written to by applications all the time. If we were redirecting this folder, it could potentially introduce latency that previously would otherwise not be there. Overall, the approach is to make the blanket exclusions at a higher folder level such as AppData\Local and any inclusions that are needed within those directories are set below it.